Cross says her mother referred to “Surrendering her upbringing”, meant pretending to be adopted when she would visit her mother. The problem was a discussion on how many individuals who had children in and out of wedlock from bi-racial parents and parents who had children from other racial makeup’s. I had to keep remembering how miscegenation was prevalent and extremely frowned on in the American culture especially in the 40’s and 50’s. During the summer months when June went to visit her mother in Hollywood, as a little girl, she would refer to her white mother as ‘Aunt Norma’ so that the friends and neighbors didn’t know that she was in fact her daughter. 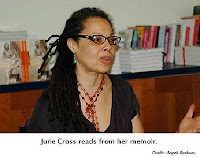 June is also the daughter of James Cross, an African American Vaudeville actor. 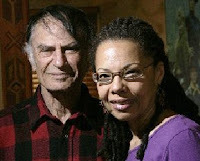 The picture to the left is a recent picture of Cross with Larry Stroch. According to my Hollywood sources complications may have been in effect when Peggy Ryan married James Cross in 1945; they were divorced in 1952. Peggy Ryan was also known by her maiden name Margaret O'Rene Ryan on 28 August 1924 in Long Beach, California - but who died on 30 October 2004 from a stroke in Las Vegas, Nevada. Ryan was also known for her high kicking American dancing and costarred in a series of movie musicals at Universal Studios tapping with Donald O'Connor. Sorry I digressed but the point was, the company that her parents kept would have been legendary had she had the opportunity to benefit from their resources, however, even though Cross was raised by a middle-income African American family located in Atlantic City. She was able to attend Harvard University, became a journalist and a documentarian. After the documentary aired according to cross, many of her mother’s friends who were liberal distanced themselves from her saying she misled them. While her conservative friends felt empathy for her. Cross apparently thought the mother’s friends would only find compassion for her discretions. Cross says the book and documentary have been therapeutic to her and her mother. My mother used to say to me all the time, what happens in the dark, will eventually come to light, be sure whatever you do, it is something that you will not be ashamed of once it is revealed. So walk like God is always present was advice that I never forgot and am pleased that text messaging and videoing isn’t as prevalent as it is now. . . There has been increasing disgust towards AIG in the past week. You would have to say that AIG earned the indignation considering the federal bailout and that the same division that almost bankrupted the company is now receiving bonuses for their risky and flagrant behavior. Because the employees almost succeeded at destroying the company, they are revered. Maybe the goal was to show, that even if they did destroy the company, that being so large the American people and our American government, who are so enamored over the glorification of money, would worship these employees. Who took the short bet that the demise of Mega Corporation would only make our government comfort and protect all them from normal bankruptcy laws, and keep them afloat? I bet you wish you had a stake in it. As one commentary read in Salon Magazine, “Life was really sucking chicken boogers” and then the hilarious review on AIG came along causing him a gutbucket-laughing season that many similar readers needed. I was not able to laugh; maybe I take losing millions of hard working Americans’ money too seriously. Obama may change his slogan at the bequest of Jay Leno on next Thursday with, “Oh, no you don’t”. Moreover, I would second that recommendation. In addition, I hope Leno is able to hear a candid Barack Obama commit on this incident. “No”, the enthusiastic head hunter replied, “that’s the media for you, they say the funniest things you know . . .” I held on to the line not knowing whether to sigh or ask more questions. I did neither; she continued, “Will you please send your resume to the following fax number and we’ll call you back for an interview”. I wrote the fax number down but still have not faxed the resume. We need to stop idolizing people who make their money off the backs of those who do not know the meaning behind the “fine print”. We need to reassess our cultural adaptation that lucre is not filthy that it purchases us prestige, power, and respect. We need to address our narcissistic morality that only applies when our reckless attitudes and behavior puts the spotlight on us. Or maybe we need to recommend that those financial planners involved in the economic disaster hold hands aligning Wall Street and take a huge suicide pact at noon, then we won’t have to put their parents, family members, and neighbors through the humiliation of seeing them answering to grand juries, trials, and media empathy. While we are at it, allow the insurance companies to pay the widows, widowers and beneficiaries unless they too are in the financial industry. This would solve some economic problems; it would stimulate the funeral industry and all of the supportive small businesses: floral shops, limousine services, casket makers, the Neptune society, black ready wear, mortgage lending, church services and the divesting of property. Need I say more? This might also send a message to those who are supposed to be in the people business that they have an obligation to the people they serve. However, you know this will not happen, because we revere moneychangers. Maybe Jesus knew what he was doing when he turned over their temple tables. I can think of a couple 401K portfolio planners’ asses I would like to kick also especially when you know they had to know.